There are three reference books that all unpublished (and many already published) writers must own: One Hundred Non-Royalty One-Act Plays (Grosset and Dunlap), 101 of the World’s Greatest Books (Greystone Press) and 101 Plots, Used and Abused (The Writer, Inc.) They are an invaluable source of ideas for the unpublished writer. If you are not lifting another writer’s prose and claiming it as your own, you are not plagiarizing. Stories, dramatic situations and writing techniques are in the public domain. Nothing original has been written since some prehistoric story teller carved fictionalized history on the walls of a cave. Originality is not a publishing demand. You are required only to write publishably. Any effort beyond that might be judged as “art” and, by today’s publishing standards, that is not always publishable. Studying the classics to learn about writing is futile. Dostoevsky, Joyce, Dickens, Tolstoy are great because they probed and interpreted human experience. Their storylines were simplistic, their plots predictable, their techniques minimal. You must adopt and adapt from the professional hacks of today. They are inventive. Writers like Robbins, Wallace, Daniel Steel, Barbara Courtland, Janet Daily, seem to have their content dictated to them by the spirits of retarded lemmings. Thus, they use elaborate storylines, panoramic plots, and razzle-dazzle techniques to conceal their nonsense. Ignore their barfy content and adapt their innovative writing methods. How are some bestsellers brought into existence today? Eventually the novel is written and published and often it is a mega-seller and the public rarely realizes they are re-reading Crime and Punishment. There may be honor among thieves, but honor is not an often used word in modern publishing. 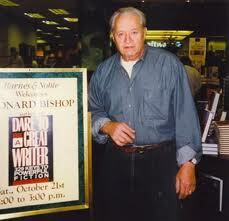 This entry was posted in humor, publishing, teaching, Writing, Writing Techniques and tagged American Novelist, American writers, best American novelists, Dare to Be A Great Writer, dramatic scenes, history of American fiction, inventing plot, inventiveness, Leonard Bishop, Plot, taking risks in writing, using existing plots, writing inspiration, writing technique. Bookmark the permalink.